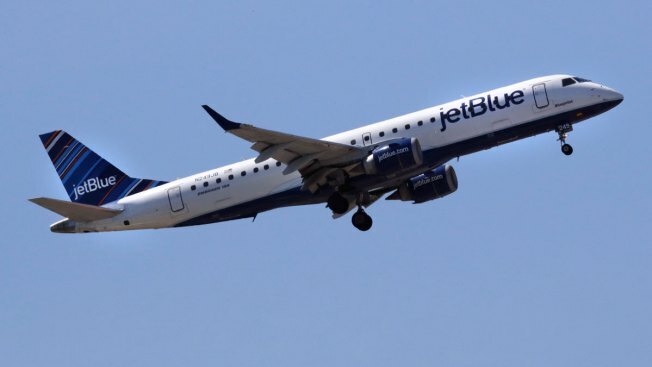 A JetBlue Airways passenger jet plane, a Embraer ERJ-190 model, approaches Logan Airport in Boston, Thursday, May 24, 2018. JetBlue Airways Corp. is restructuring its operations and "eliminating a number of positions" through layoffs, buyouts and attrition, spokesman Doug McGraw confirmed Friday. The low-cost carrier called mandatory meetings at its Long Island City headquarters Friday to lay out the details of the plan following a review of its organization over the last several months, CNBC reported. The cuts will mostly affect the company's behind-the-scenes operations in New York, not flight crews, McGraw said. The company is trying to lessen the blow by cutting positions as people resign and offering compensation packages to employees who leave voluntarily, he said.